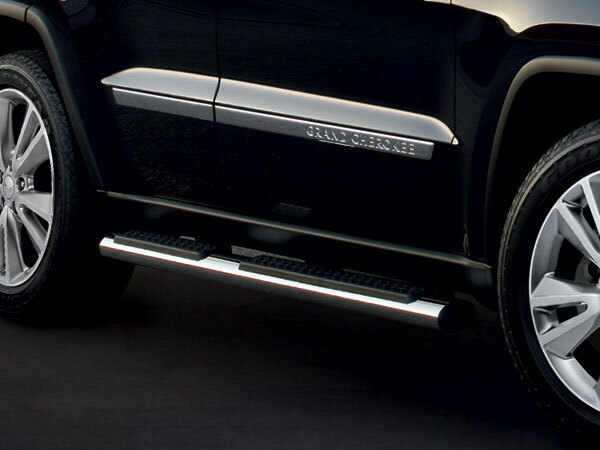 If the side steps in your Jeep are worn out, or if you just think they're a little too drab and unremarkable, and you'd like to step on something more stylish when you climb into your four-wheel-drive vehicle, then check out the premium Tubular Side Steps available at JustforJeeps.com for late model Jeep Grand Cherokees. The lightweight aluminum Tubular Side Steps keep their diameter the same and boast a surface that's skid resistant, so you can count on their safety when climbing in or out of your Jeep. Comes as a set of two 4" oval steps. Available in black painted aluminum or chrome plated aluminum. Comes with all hardware. Will not fit Summit, High Altitude or SRT8 models. Please select desired color above. Step bars arrived promptly once ordered. I had a few questions prior to ordering and justforjeeps.com responded quickly. The installation was easy although the directions are vague, it took me (a novice) about two hours. I would have given this product a five - but the instructions are so bad - it doesn't rate it. The quality is exceptional, Great fit and look. But... no written instructions... pictures only.. it was impossible to tell what they were trying to say about the mounting hardware that went inside the rocker. Very happy with the look and fit of the steps. Fairly easy to install with two sockets and two wrenches. Took about an hour for each side. Wheel ramps would have made it easier. ProsEverything fit perfectly and they are very securely mounted. ConsInstructions are abysmal but thankfully the brackets are stamped for front, middle, and back. Product looks great and good quality. Easy install if you prep the right tools and match brackets to proper sections. Instructions won't help much. Zero need to remove rocker panel trim. I bought the chrome finish. The directions are terrible. 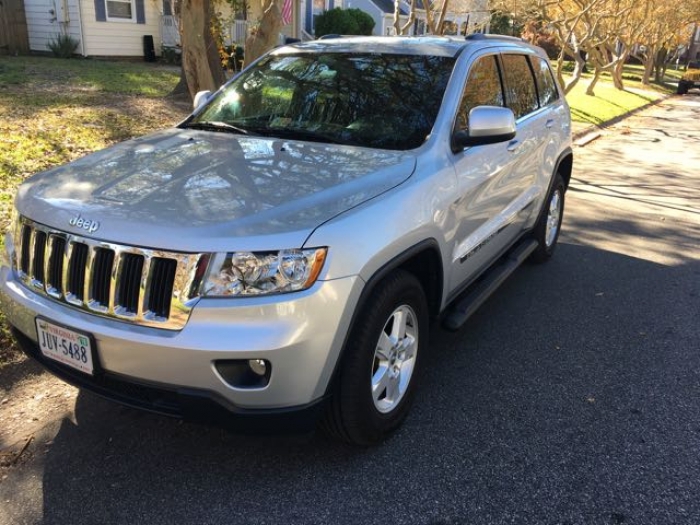 I have a 2014 Overland. Although the kit includes new plastic rivets to reattach the body molding under the doors to the frame, that molding does not need to be removed. It flexes enough to slip the brackets in place. On the passenger side, there is a wiring harness that runs front to back, and it needs to be unbolted and pushed out of the way to secure the horizontal bolts for the side steps. I wasted time trying to figure out how to get the bolts in without moving the harness first. Also, two of the side step bolts (in the middle of the car) need to be reversed (head on the inside instead of outside), to fit and allow the harness to be put back into its place. If I knew this upfront, it would have been a two-hour job, rather than almost four. You do not need a lift, but it would make things easier. I really like the steps now that there on, But the instruction are bad. Once we figured it out they look really good on my Trail Hawk, Look to be of good quality as well. Excellent fit, looks great and no need to remove or replace any trim rivets! We bought these because our 7 and 4 year old struggle to step up and step out of the Jeep. Install was very easy on my 2018 GC Altitude. As most everyone has said, this is a great product for the money but it comes with almost useless installation instructions. I agree with previous reviewers that you should lay out all the parts and look under the vehicle before blindly following the instructions. I agree that you do not need to remove the trim fasteners (I did on one side before re-reading a review and then I did not remove on the other side; worked fine). Plus, the replacement fasteners they give you won't work unless you have the necessary special tool to use the rivet they supply. I had to buy some replacement fasteners to replace the side I took off. 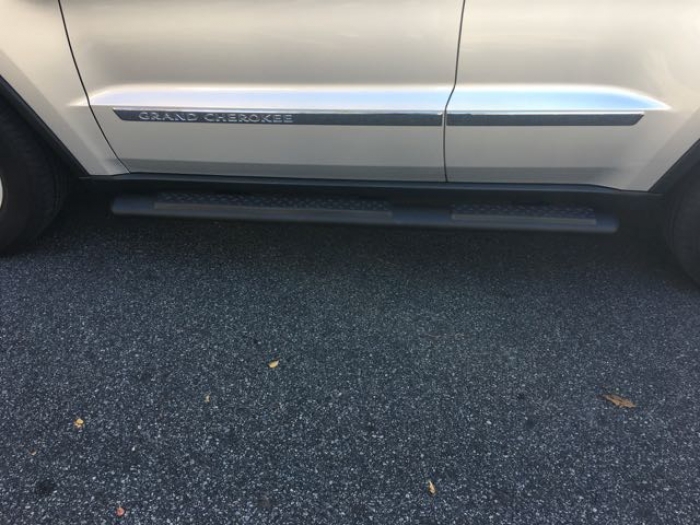 My only disappointment in the function is that they are a little narrow and it is tough to keep your foot in place getting in and out; it works but another inch or so in the width would be better as they fit pretty close to the rocker panel. I'm short so I really do use these, not just there for the looks. 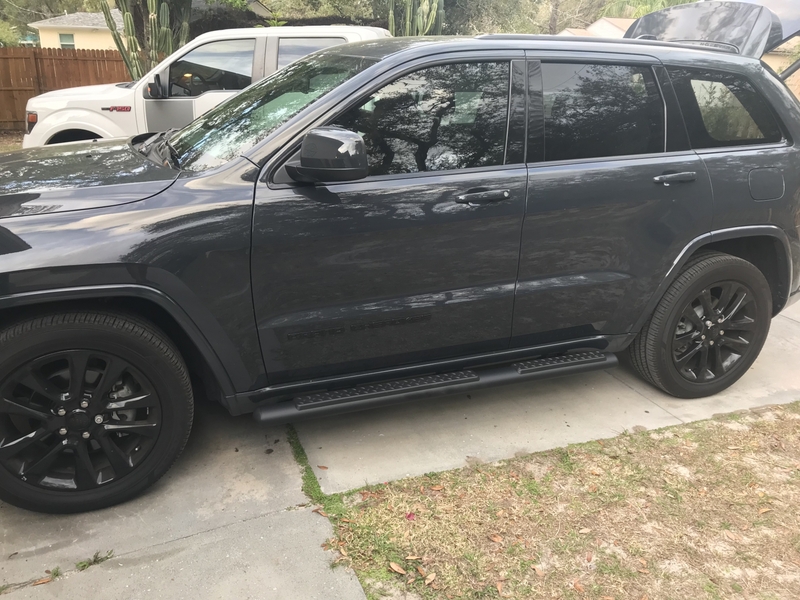 Am very pleased with the Mopar tubular side steps that I just installed on my '18 JGC. It makes it a lot easier to access the roof and to help those with a bit shorter legs to get into and out of the vehicle. Also it just looks nice. Took about 90 minutes to install - all the parts were there and the instructions were easy to follow. 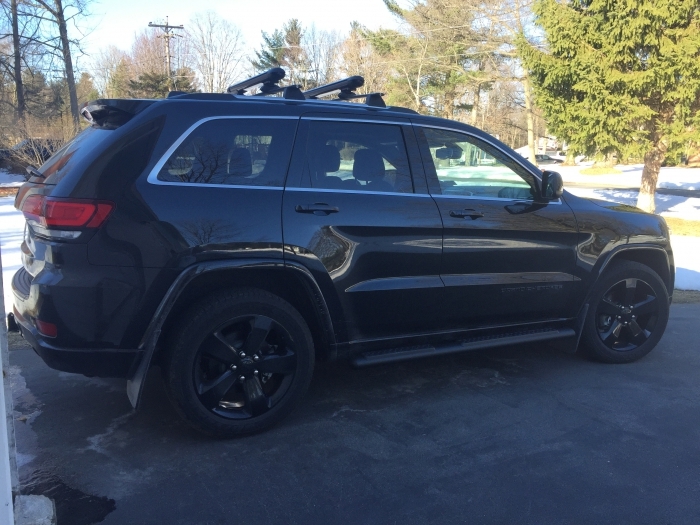 They look super nice on my 2017 Grand Cherokee. Box and items came in perfect conditions. Was missing some hardware but the guys took care of me and overnight me the hardware, so customer service gets an A. Took me about 2 hours to install. The instructions are not the most helpful but once you look underneath the vehicle with one of the brackets it will make sense. On the left side I didnt have to removed the trim. On the right I just had to remove 2-3 nuts just to fit the hardware. I started to remove the trim, then noticed didnt have to. It brings the plastic rivets to reinstall trim, but if u dont have a plastic rivet gun, then try not too remove it. The running boards arrived on time and were nicely packaged. The only issue was the instructions. Mostly pictures and vague. Some points i would like to make that you DO NOT HAVE TO DO: trim piece under door does not require removal (trim pins will not be used), only 3 of 6 frame seals have to be be cut out (you can locate those areas by laying out the assembly next to truck on a blanket). Assemble all attachments/bolts; fully assembled before tightening/ torquing down; this will give the ability to get all bolts in and any adjustment needed. They look great!!! The installation instructs need to be more explicit and detailed. One mounting bolt would not thread into side step and needed to be drilled and tapped to a larger size. Excellent product. Fits our jeep perfectly and looks great. ProsExcellent product. No drilling required. ConsDirections could have been better. Pictures were some what unclear. 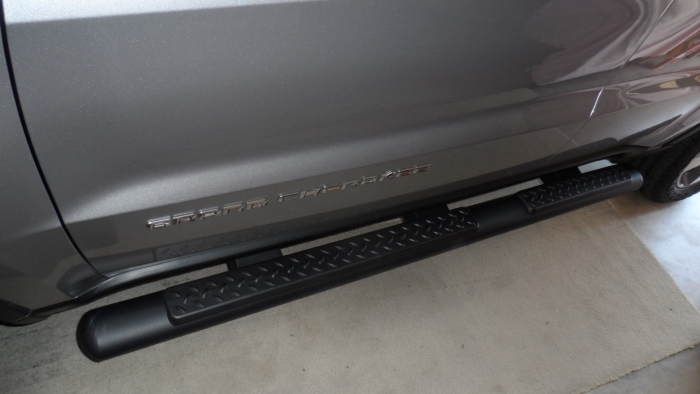 Ordered side steps for my Grand Cherokee. Arrived quickly, packed well, all mounting hardware included in box. Easy install. Perfect alignment between side step mounting holes and original 3 Mounting locations. Would purchase from vendor again. These arrived today late afternoon and haven't been installed. They look great and they were very well protected in the box. The shipping, however, took forever. This was my very fist order, and it was the last to arrive. USPS took their sweet little time to the point of delaying delivery. Product-wise I'm happy, delivery-wise I'm not. Looks good and is sturdy. Functional for small children and handicapped adults that have difficulty climbing in. Easy installation if you are a little mechanically inclined since instructions leave a lot to be desired. Steps are solid , great quality, the price is amazing and the shipping was fast. 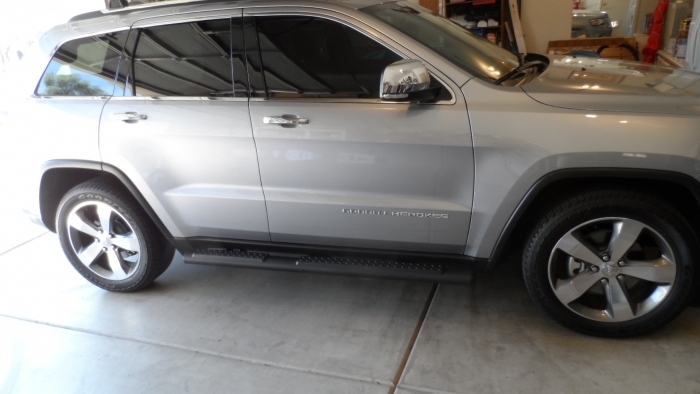 Black tubular side steps look great on my 2015 Jeep Grand Cherokee LTD. ! The side bars were delivered in great & sturdy packaging and in perfect shape. Installation directions are a bit confusing with no written instructions on each little picture but was able to figure things out after a while. I did the installation on my garage floor btw which made some nut installs challenging a bit. I started with right side (hardest side) with the wiring harness which needed to have all the bolts removed & left loose during the bracket installation. Only 3 of the grommet plugs on each side needed removal (where the brackets go only) and it was NOT necessary to remove the lower trim/kick panels at all. I recommend laying out all the bracket and plastic insulator pads on each side (front, middle, & rear as stamped on boxes and inside each bracket) BEFORE you begin and have the set of nuts bolts and washers placed near each bracket accordingly before starting. The main bracket bolts (part F) is tricky since it just lays inside the oval frame hole loose and tends to push up when trying the screw on bolt to hold bracket. To hold it in place better, I put a glob of shoe goo (or use any sticky caulk or glue) on each flat plate before sliding into the holes upside down and that helped hold it in place better then when they are installed with nothing at all. I oiled each screw and hand threaded each bolt to almost tight. Leave all your bolts slightly loose (just snug) until you install the steps then go around and sock them all down as per recommended torques. I also recommend using Loctite on all the 6 step bolts (part C- 16 ft-lbs max torque) since you do not want to over tighten these and pull the studs out. Install took 2 hours on the right side (went slow and carefully) and 40 minutes on the left side (much faster after the learning curve). Steps look great except now my neighbor wants me to install a set on his truck !! ProsSolid Mopar OEM product made in Canada....looks great. Great Price at JFJ Wife and grandkids love them! Good product, looks sharp, works as it should. Nothing really to say other than it looks good and works. Haven't had it long enough to know if it will hold up but so far so good. The instructions are useless and the mounting system is hokey. Ignore the instruction to remove the riveted trim. With a little patience you can install the steps without removing the trim. I just installed the new black side bars. It is not necessary to remove the rocker panel or kick strip as I call it. 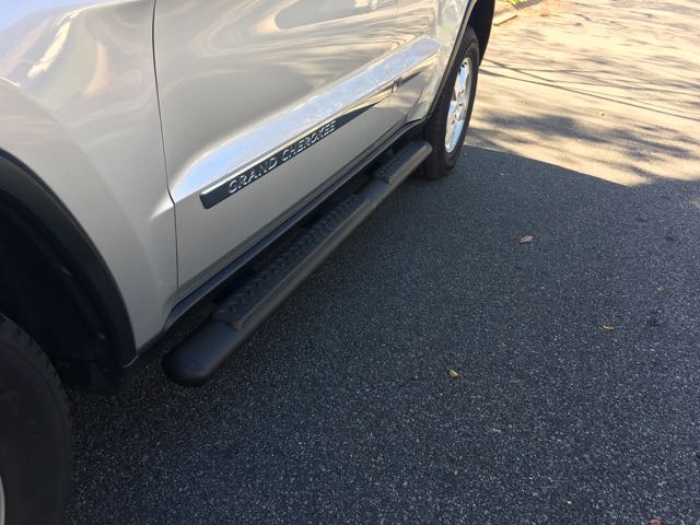 Saved a lot by ordering these sidesteps and installing myself. Gives my jeep a nice rugged look. Good product, very helpful for my young kids in getting in and out of the Jeep. 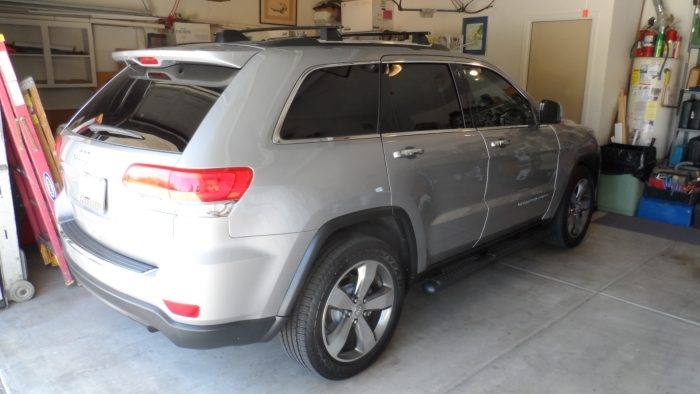 I don't find that the Grand Cherokee is so high that they are that useful for adults, but the kids love them. They add a nice look, especially in black (my Jeep is dark gray). I'm overall happy with the purchase. See cons for an important install note. ProsFunctional, good looking, relatively easy install (see exceptions below). ConsThe instructions are a disaster...very confusing, unclear diagrams, no written explanations. 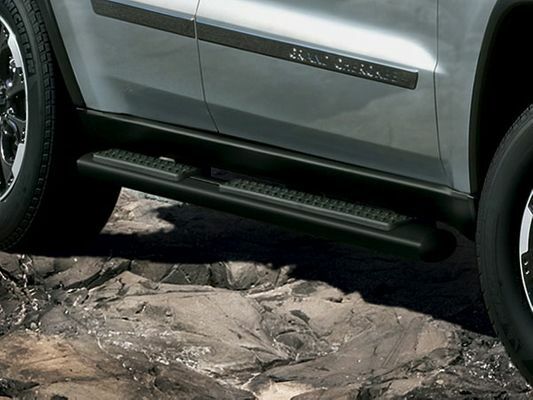 In addition, the instructions say to remove the rocker panel trim prior to install and then replace with new plastic rivets, which are supplied. At least on my 2011, the re-installation requires 18 rivets total, but only 12 are supplied. The instructions say that there are bolts where there are actually rivets and they leave out two of them entirely. I found that with a little patience I was able to complete the install without removing the rocker panels. It's tight but doable. These tubular steps were easy to install, took about 1 hour for each side, I installed them alone in my garage. They look great and my family uses them to step on, to enter and exit vehicle. ProsGood looking. Help people step in vehicle.